This week I ran a session on differentiation with our NQTs. I felt it was a good, open session where we could all share some ideas and describe the challenges that we face in meeting the learning needs of all of our students. The fact is that we all find it hard – and that’s because it is; sometimes it can feel as if you’re never quite getting it right because someone or other isn’t flourishing. As with many things in teaching, we need to aim high but we also need to be realistic, pragmatic and tolerant of imperfection in order to flourish ourselves. To begin with we talked about the myths. Differentiation does not mean that you must have tiered resources and tasks in every lesson. It does not mean you should have must-should-could learning objectives. It does not mean that a lesson where every student is doing the same task is fundamentally worse than one where students do have different tasks. Any given lesson snap-shot may not have explicit evidence of differentiation at all – and it could still be outstanding, or at least be leading to outstanding outcomes. We talked about some of the bottom-lines. In real life, we have ups and downs.. and a bottom line. Dotted. 1. Neglecting the basic access entitlement of students with particular learning needs. If you have a student that can’t read the text-book or follow the standard instructions because of learning difficulties or physical impairment, you have to sort them out every time. You need to plan for their needs every lesson and go to them immediately to make sure they know what to do. 2. Setting work that is too easy for the top end. There is nothing worse than having students waiting for others to finish with nothing to do or simply having time for a good chat because they’ve completed a basic task. Here the solution is to set in-built extension tasks as a matter of routine. “If you finish Task A, then go straight on to Tasks B, C and D”. Of course, there is the issue that ‘more work’ doesn’t necessarily equate to ‘more challenge’. It’s better if each task is increasingly difficult and you can always consider allowing students to skip Task A and B if they feel confident to tackle other tasks straight away. At the very least, there should always always be a ‘what next’ if the initial task is quite easy. We also talked about data. We’re saturated with data but it only helps if it comes off the spreadsheet and influences our practice in the classroom, helping us to understand and address the needs of the hundreds of students that we teach as individuals. The main use of student data is to prompt you to ask questions about your perception of a student’s ability and progress. Am I getting this person right? It pays to look back at prior attainment information a week or so after meeting a class for the first time and again after the first term. If you triangulate between the prior attainment info, your gut feeling and your own assessment data, you get a better idea. Sometimes it’s quite revealing. Oh gosh, I’ve been underestimating John all this time…. or perhaps I’m neglecting Michael’s underlying lack of confidence; his reading age is lower than I thought. Most importantly, data helps to ensure that you never settle for mediocrity from someone who doesn’t perform in the way the data says they could. Ben’s Official Target grade is A but his recent test score was C? Ok…something is going on there. That should catalyse a different response than if the prior attainment data suggested C would be a sign of good progress. In my last comprehensive school job, I used to devise a differentiation guide for every class to help me plan lessons without forgetting about people. Other teachers made their own. An example is shown here. The grade here is artificial; in reality there would be lots of data points feeding into the crude categorisation: reading ages, MidYIS scores and KS2 entry data would play a part alongside other internal assessments. 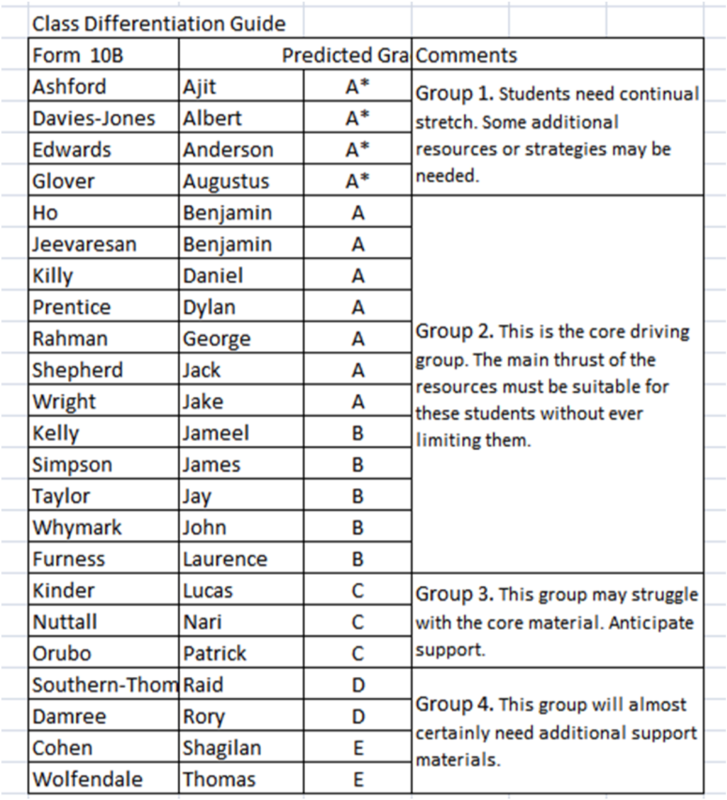 The idea is to make it easy to think about the students in rough groupings rather than allow the complexity of the individual data sheet, usually presented in alphabetical order, to be overwhelming and ultimately unhelpful. I know a lot of people will go into ‘Growth Mindset’ shock. It’s important to have that in mind. You are not using this to pigeon-hole students indefinitely.. but sometimes you need to cut through the noise to get some shape to your class and make differentiation meaningful and practical. If you allow yourself to let a guide like this write students off, then it’s a mistake. If you use it to prompt you to prepare more effectively to help them learn better, then it’s a good thing. The dynamics of each class will be different but personally I try to teach Group 1 and 2 in the same way, teaching to the top and thinking separately about the students who might struggle. However, even then, there are one or two students in most of my classes who stick out at the top, running far ahead of the rest, who need special attention. An important source of information worth revisiting once you know a class, is the SEND register and associated documentation. It’s painful to realise that you have overlooked the info suggesting Jameel should sit at the front or that Jay is dyslexic and has gets help outside the school. It’s hard to take it all in at the start of the year so, from time to time, go back for a look at see if you need to adjust things. You may even have positive information to feedback to the learning support team in your school. In a mixed ability setting, when you are up against it in terms of fine-tuned planning, you can always create open-endedness through the questions you ask in discussion and the tasks you set based on the same key resources. That’s an important skill to develop. Whether it is a piece of writing, some practical work or a set of responses to a debate or some theory in science, you can usually set students off in different directions from a common starting point. It is easier if the standard resources (text books and departmental ready-to-use worksheets) have a level of tiering built-in, but even with identical resources you can often direct students to produce responses at different levels of sophistication. Each specimen, lovingly nurtured. But not necessarily all at once. Finally, teaching is a bit like gardening. You have a group of individual specimens with their own precise needs and qualities and your job is to get them to flourish to the greatest possible extent. 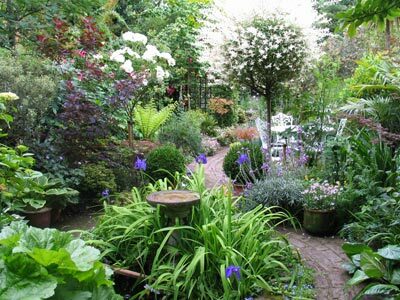 But, as with gardening, you often need to focus on one specimen at a particular moment. You can’t do it all at once. You may feel that John is coasting a bit; he needs a push this lesson. It may be that Albert has looked a bit bored of late. He might be finding things a bit easy; let’s really crank it up this lesson. The last time Rory handed his book in it was a bit of a shocker; I need to sit with him this lesson and get a few things sorted out. Daniel is always just below the top level. Why is that? Is this an Austin’s Butterfly effect? Maybe he needs to do some re-drafting and I need to absolutely insist that he does it again and again until it’s hitting the top level. That’s real differentiation: pushing, prodding, nudging, stretching…slow, subtle, nuanced, a step at a time, working around the class from lesson to lesson, to the greatest extent you can manage. It’s not a performance; it’s something you grind out over the long long run. Within this, I think it helps teachers to forge special relationships with the students at the extremes – and their parents too if possible. In all probability the strongest and weakest learners are likely to be the ones who you struggle with the most in terms of your planning and teaching. If you let them know very clearly that you are working for them, keeping an eye on them and giving them a bit of special attention, they will have confidence that, when things aren’t quite tailored to them, you haven’t forgotten. Their parents will know this too and that helps a lot. My advice is always to try to be a teacher who champions the students with the greatest needs; it always pays off. But, more generally, the main thing is to keep differentiation at the forefront of your thinking, doing your best to keep everyone in each class moving forward without limiting them. It’s never going to feel that you’ve got it absolutely nailed – and that is teaching! great post! especially the “differentiation guide” seems a very simple, though very practical idea. Reading this I am struck by something that is pretty obvious, but easily lost. One of the key points is teacher intention, and this is difficult to maintain if something is encased in an externally imposed structure. So, differentiation (as portrayed in this blog) is about being aware of the learning needs of the students (where they are now, and where they were), and intending to actively move each of them on in an appropriate (for them) way. The teacher is aware, and reads the signs; the teacher adapts and plans in response….accepting that this is difficult and not every student will advance at the same pace. More importantly, perhaps, is that the SLT recognise all this too, and don’t impose an impossible framework for ‘differentiation’ which only leads to demotivation and a box ticking approach. Teacher intention. I think the same principle might apply to many other situations…an externally imposed structure probably isn’t the answer. Being new to the twitter world and having found your and other people’s blogs I am just astounded about how much I am learning and my thinking about teaching is improving. What is wonderful here is the understanding you have shown to both teachers’s workload and what the pupils need in their lessons. So often the balance is skewed to make the task seem impossible but you make it all seem achievable and this gives me the fire to go on and do more. It’s also interesting reading the insightful comments often found from others and I understand where chemistrypoet is coming from with an externally imposed structure. I am all for more teacher autonomy about what they do but I think your piece also provides a good level of guidance which is what a good leader always does, and I would also suggest that the autonomy does need to be monitored and justified in some way and this is the SMT role. How to do this in a supportive and “inspiring to do more” way is a difficult challenge. A reflection to share on differentiation – thanks for this Tom! Finally a bit of sense about the issue of differentiation. I have seen teachers be run ragged trying to do numerous different types of worksheet and multiple concurrent lesson activities, and in each lesson, in the name of differentiation. I prefer a more long term view myself. I’m coming to the end of my PGCE (secondary) year at the moment, and the one thing I’m really trying to work on is my differentiation. I’ve been using a lot of open ended questioning, but I was struggling to find ways of showing in my plans and my portfolio exactly how I was differentiating. Thank god for this blog post, the differentiation guide is exactly what I need! A really great idea that will benefit my practice, thank you! Thanks. I’m glad you found it useful. It keeps it simple and practical. Differentiation is a difficult nut to crack. In yet another brilliant post, Tom Sherrington shares some of his approaches to nurturing the potential of all the students within his groups. At last some common sense around differentiation – THANK YOU! I’ve been saying this for years; differentiation is not about three worksheets, but rather about building ramps next to steps. It’s great to see a head teacher taking this line; I love your plants metaphor. 1. The differentiation guide for each class: a simple way to organise data to inform one’s planning and questioning. Clearly it is just a guide and students can and will surprise me. 2. ” The fact is that we all find it hard – and that’s because it is; sometimes it can feel as if you’re never quite getting it right because someone or other isn’t flourishing. As with many things in teaching, we need to aim high but we also need to be realistic, pragmatic and tolerant of imperfection in order to flourish ourselves. ” This is excellently put, and true for so much of my teaching. 3. The two non-negotiables: access to the work for those that need it, and stretch for the top end. Yes, these should be essential parts of every lesson (or sine qua nons). And working on the relationships with those students at the two extremes and their families resonates with me. Certainly I can see that would helpful at the end of those students who find accessing the work challenging, and although I have had great success with my top sets (18 A*s this year), I had a row with one student who ended up with 11 A*s. Last year I had an argument with the Head Boy who also ended up with exceptional results. It seems there might be something I need to look at in my relationships with students such as these. Typically, they weren’t the best at maths, but still got very high marks. I wonder what the problem is that I have with these students. This year, I will try to be “be a teacher who champions the students with the greatest needs”. 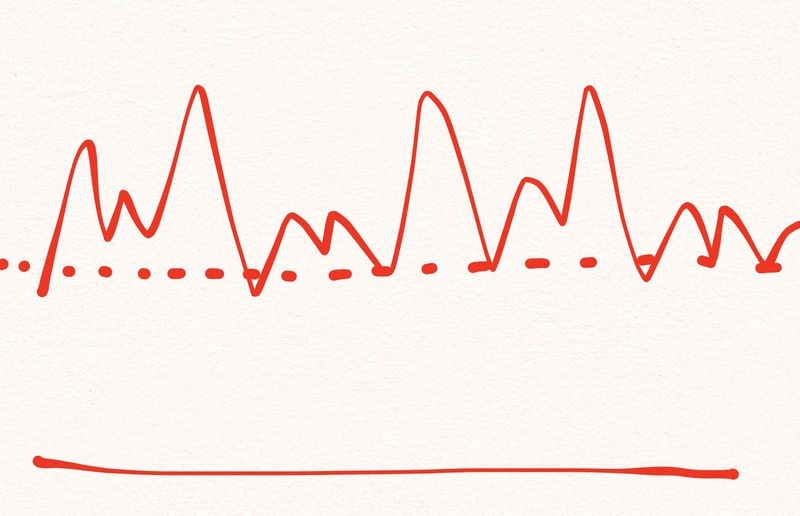 Also, I very much like the informal diagram of ups and downs and the bottom line. Thanks so much. Glad it resonates. I feel it’s important to acknowledge when things are difficult to do. We can beat ourselves up too much. Thank you. I am struggling with differentiation as an NQT. All classes are mixed ability. I am starting, finally, to use the different tasks derived from the same starting point. I still find the balance between those who ‘don’t get it’ and those who are coasting / have finished early on a task a difficult one to strike. It is hard and it is somewhat reassuring to know that we can’t get it right all the time. Long term gains are important. I intend moving along the route of ‘same resources, different questions’. I love this and will share with teachers asap! Thank you 😉 can you ping it to my email below please?